Today’s post is a two part mini-series on baking with tea in collaboration with my new friend Daniela from Tea Cachai! I’ve found that one of the coolest parts about blogging and social media is getting to connect with all sorts of passionate and interesting people from around the world… and sometimes right in your backyard too! The latter is the case with Daniela, a blogger, momma, and tea sommelier extraordinaire (tea sommelier – isn’t that awesome??) who lives just a few miles away from me! Her blog covers everything you need to know about tea: from brewing, to pairing, to incorporating it into your baked goods. And once she and I discovered how close we live to one another, we knew we had to get to know each another better! Before long, Daniela and I got excited about the idea of collaborating on a tea-infused baking project that would bring together her love of tea with my love of baking. 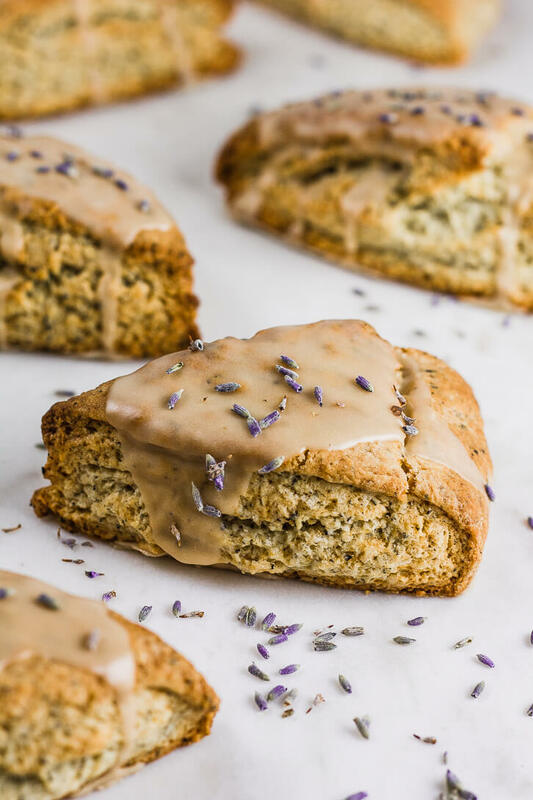 We’ve been so excited the past couple weeks to share the (delicious) results with you, starting with this recipe for lavender and earl grey scones! There are a few different ways you can incorporate tea into your baking, and this recipe involves two of them. First, we added tea leaves directly to the dough, and we also infused some of the liquid in the recipe with tea. For the Earl Grey scones, we added the ground tea leaves from a few bags of Earl Grey Tea directly to the dry ingredients for the dough. I learned from Daniela that it’s best to use tea bags (as opposed to loose-leaf tea) for this method, since the tea is usually ground much more finely in tea bags. I loved how the tiny flecks of tea gave some good character to our scones! For the icing, we steeped the milk in a couple teaspoons of culinary lavender as well as some more Earl Grey tea, which made for a lovely, floral, and tea-infused glaze. You can make your glaze as thick as you like by adding powdered sugar a little bit at a time until you reach the desired consistency and level of sweetness. Lavender and Earl Grey are a classic pairing, and you’ll understand why when you taste these scones! Personally, I thought it was a really aromatic and refreshing combination. If you like, sprinkle some extra lavender (look for culinary grade lavender) on top for even more flavor, as well as a pretty effect. If you want to learn lots more about tea, as well as how to incorporate it into your baking, head on over to Tea Cachai and meet Daniela. We hope you love these scones as much as we did! A perfect recipe for breakfast or afternoon tea, these buttery Earl Grey scones are iced with a lavender and Earl Grey tea-infused glaze. Preheat oven to 400 degrees Fahrenheit and place a silicone baking mat on a large baking sheet. In a large bowl, whisk together the flour, sugar, baking powder, and salt. Open the 3 tea bags and empty the ground tea leaves directly into the flour mixture, whisk to combine. In a small bowl, whisk together the cream, egg, and vanilla extract. Make a well in the middle of the dry ingredients, pour in the wet ingredients, then mix together. Once completely combined, turn the dough out onto a lightly floured surface and knead until it comes together. Shape the dough into a disc about 8 inches in diameter. Slice into 8 wedges. Place the wedges about 2 inches apart on the silicone-lined baking sheet and bake at 400 degrees for 18-22 minutes, until scones are tall and golden brown. Transfer to a wire rack to cool completely. In a small saucepan, bring the milk and lavender to a simmer. Remove from heat, then steep with the two bags of Earl Grey tea for about 7 minutes. Using a small sieve, strain the mixture and discard the lavender. Measure out 1/4 cup of the steeped milk. Pour into a small bowl and whisk together with the powdered sugar. For a thicker glaze, add more powdered sugar until desired consistency and sweetness are reached. Once scones are cool, drizzle with glaze and sprinkle with lavender. *Cold, grated butter will give you the fluffiest and flakiest scones! But if you prefer, you can cube the cold butter (rather than grate it) before cutting it into the dough. If you don't have a pastry cutter, use a fork, or even your hands (but work quickly, so as not to let the butter get too warm). I loved collaborating with you to make tea baked goodies! I hope everybody enjoys them as much as we did! Oooh, Earl Grey cookies sound lovely! And I think a cup of Earl Grey tea would be the perfect complement!! Absolutely delicious! This was my first time branching out from my go-to basic scone recipe, and they turned out beautifully. Grating the butter really does help so much in making scones light and flaky!